One of the biggest new experiments for me this semester is the Portfolio as an alternative to the Storybook, and now that Week 5 is over, I can report on how that is going since Week 5 is when the students made their choice! Update: Week 10. I continue to be really pleased with how this option is working! One student decided to switch from her Storybook to the Portfolio option because she was so pressed for time, and that ended up being okay too. I was a little worried about how that would work since she was switching in Week 7, but she had so many good storytelling posts to choose from by that point in the semester that it has gone really well! BRIEF DESCRIPTION. Each student completes a semester-long writing project, choosing to do either a Storybook (writing on a single topic) or a Portfolio (collecting their best weekly blog posts). You can see the schedule of assignments for both projects, along with information I provide to students about choosing between the Storybook or Portfolio. 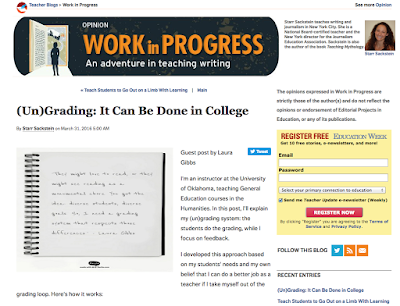 I have always required that the students do a semester-long writing project with a fully developed writing process: brainstorming, research, writing, revising... and revising some more. LOTS of revising. Since I started teaching these courses back in 2002, that project has taken the form of a Storybook, in which students choose a topic and come up with a storytelling plan that suits their topic. You can see an archive of past projects to see the results: Myth-Folklore and Indian Epics. Starting in Fall 2014, I am offering an alternative project: instead of a Storybook, students can instead choose to compile a Portfolio of stories chosen from their weekly storytelling blog posts. This is similar to the Storybook in that it is based on writing and revising, but the stories are not connected to one another. Instead, they respond to the weekly readings in the class, using whatever style the student happened to have chosen that week for their storytelling experiment. So, just as for the Storybook stories, students will be turning in a new story to me every other week, and I will give them detailed comments back; they then revise the story, I read it again... and the it is time to add a new story to the Portfolio. At the end of the semester, the students will have a set of four or five stories labeled as "Portfolio" in their blog, accessible via the label link. To see how this is going to work, here is one student's Portfolio for Fall 2014 (one story so far). So, as the semester begins, all the students explore past Storybooks and go through the brainstorming process for a Storybook, which culminates in writing an Introduction in Week 4. Then, they decide which way to go: carry on with the Storybook or opt for the Portfolio instead. The Storybook brainstorming is productive for its own sake, and it is also very helpful in preparing students for the kinds of writing they are doing in their Portfolio also, so in no sense is the time spent on early Storybook work lost time at all. In fact, one of the first Portfolio-related assignments I ask people to complete is to look at existing Storybooks to brainstorm about all the possible styles they might want to explore in their Portfolio over the course of the semester: Portfolio Brainstorm. I'll surely have more to say about the Portfolio project as the semester goes on, but my verdict after the first week of Portfolio assignments is that it was a big success. I read and replied to all the Portfolio stories, and next week those will be coming back in as revisions, while students will also be getting feedback from other students this weekend, just as for the Storybooks. I'm really excited about that! In the old system, the students who were struggling and/or behind on the Storybook did not get any feedback from other students until their Storybook was actually online and ready to read. Sometimes that meant they were out of the student feedback loop until Week 6 or even Week 7. Now, with the Portfolio, they are going to be part of the give-and-get of student feedback this weekend, along with everybody else. I'm so happy how this has gone so far, and I'll report back again later in the semester! I had been troubled by the fact that every semester 1 or 2 students abandoned their Storybook projects before the end of the semester. It was never more than 1 or 2, but it was a persistent problem. Not every semester, but almost every semester, at least 1 or 2 Storybooks never got finished, and I felt badly about that, since the experience was surely not very satisfying for the student. It also made me wonder, of course, just how many Storybooks students were finishing because they "had to" and not really because they wanted to. So, this had been simmering on the back burner, but it was never really a big enough problem that I devoted a lot of thought to it specifically; I had other, bigger problems to work on, ha ha. But then, one day last spring, I had a BRAINWAVE. I can date it specifically to March 29 as I learn from this old Google+ post. It was kind of eerie to read that post now and realize that the idea was kind of a "birth of Athena" thing, because what I ended up doing is almost exactly what I figured out in that moment of revelation back in March. Freaky! And here's how it turned out this Fall! In the Myth-Folklore class, the first time this option was offered, 7 students chose the Portfolio out of 48 students total. In the Indian Epics class, 7 students chose the Portfolio out of 32 students total. I really did not know what to expect, but I knew there would be more takers in Indian Epics because the reading load in that class is more demanding than in Myth-Folklore, so the students are pressed for time, and it's also the case that finding a topic for Indian Epics is more challenging, especially when Indian culture may be something completely new to the students, as it often is. So, that means 14 students out of 80 overall chose the Portfolio. I will try to remember to update this post every semester so that I can keep track of this over time! GOALS. Since the semester-long projects are really the heart-and-soul of my classes, it's hard to list just a few goals; I have so many goals here. So, please look at the goals that I have listed for the Storybooks: TEACHING WRITERS. 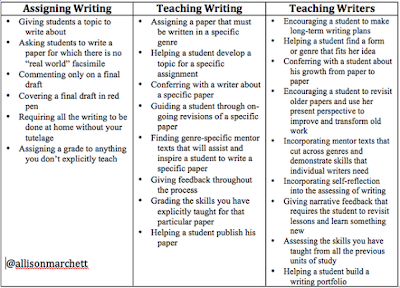 All those goals hold true for the Portfolios too, and I've reproduced that "teaching writers" graphic below. Choice. Give students a wider range of semester-long project options. Time Management. Help students who are facing serious demands on their time. Blogging. Provide students the chance to develop a "curated" section of their blog, featuring their best posts. I am glad that there are enough Portfolios in both classes that it is not going to be seen as stigmatizing in any way, although I am still worried about that. I am hoping to gather some testimonials from the students at the end of this semester about whether they are glad or not about having chosen the Portfolio. I think their testimonies could be very useful in helping students decide to opt for the Portfolio. I really think BOTH options are excellent, and I am delighted by both writing projects. If all goes well, the students doing Portfolios will have a good experience with that, and I can find a way to share that positive evaluation with next semester's students so that people will see that the Portfolio is a great option, one that every student might want to consider! In particular, I was glad to see that some students who are strong writers DID choose the Portfolio option. I suspect they did so because they are feeling overwhelmed by their many obligations, so it just makes sense for them to choose the option that lets them build on the existing stories in their blog, rather than writing additional stories. So, as students read the Storybooks and the Portfolios, they will see strong writing in both types of projects, along with less strong writing, since in every class there is an incredibly wide range of writerly experience, writerly interest, etc. Luckily, though, it is not going to be the case that students will be associating the stronger writing with the Storybooks. There is a range of writing to be found in both types of projects and, of course, with the revising, both the Storybook stories and the Portfolio stories will get better and better, week by week, all semester long!